Jackson and I at the birthday party at the park. Embracing the goggles! So yeah, that was my son wearing yellow construction goggles to a birthday party at the park, and to swim lessons the day before. That was also my son who, another day, refused to take out his football mouth piece during swim lessons. Yep, he swam under water, blew his bubbles, kicked his fins, and even sang the songs with a cut-to-his-size, conformed-to-his teeth, youth football mouth piece covering his upper row of chompers. I must applaud his level of commitment. Heading to swim with his "goggles" on. I can’t tell if he loves the attention, doesn’t realize or care that he looks like a weirdo, or if he’s much smarter than I give him credit for and just enjoys seeing me squirm. Whatever the reason, he just turned three and of the battles I pick on a daily basis, these just don’t make the cut. I mean, yes, I’m a little embarrassed. Yes, certain costume accessories may occasionally “go missing” before outings, but if I have to choose child-in-meltdown versus child-in-goggles…I choose goggles every time. Behind the twinge of embarrassment, I have to admit, I think it’s pretty adorable and admirable. I envy that kind of naivety. Right now, to him, wearing yellow goggles is nothing but an innocent expression of his imagination and adoration for hard working men. At some point, something like wearing yellow goggles becomes a statement. (Let's hope he doesn't lead a new trend: hordes of teens all wearing yellow goggles to express their "individuality.") For now though, he gets a few more years of the blissful stage where dreaming so openly, so confidently to be something great (in his eyes at least), isn't marred by making statements or by insecurities of his abilities or by fear of judgement. Dream on Little Boy in Yellow Goggles! Dream on. The yellow goggles were temporarily out of commission with broken elastic, so I ordered a clear pair. They both get used, sometimes simultaneously, with regularity. Here we are road tripping from Dallas to Denver. Carseat safety is very important in this family. You can never be too careful. I shared a little piece of this on Facebook and the comments I got from other moms had me both cracking up…and realizing I am not alone. One friend of mine has twin boys a year older than Jackson. One of her boys will only wear his Ninja Turtle swim suit and rash guard to church on Sundays. Every week, the same thing. The other will only wear “short jeans,” because other shorts just “aren’t right.” Another friend’s son, who is grown now, went through a stage where he would only answer to Superman. My little brother Gabe had several of these stages. I distinctly remember him dragging a giant stuffed bear, bigger than he was, through the mall when he was about four, and I, about seven, walking several paces behind him trying to blend in with the family behind ours. And one year he was obsessed with being a fireman, so my mom scrounged together a make-shift fireman outfit for him: a big yellow raincoat, black mud boots, a paper dust mask like lawn men wear when mowing, and a construction hat. He wore the whole getup EVERYWHERE for weeks, months maybe...in my head it feels like it was years. I couldn’t understand why my mom let him wear whatever he wanted, why she didn’t just face the tantrum and force him into “normal” clothes. But now, a mother myself, I get it. It's not about the tantrums. Facing the tantrum, in many ways, is the much easier choice. Facing the goggles in public: now THAT is bold parenting. Let them be little. Let them be imaginative. Let them be...whatever their little minds can think up to be. 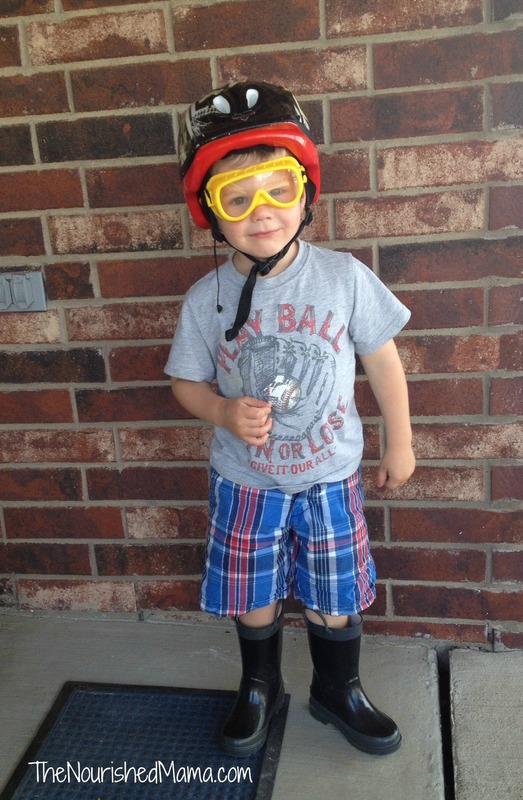 Does your child have any "yellow goggles" that go everywhere with them? Do tell!